In May, best friends Ben Dwulit and Josh Hubert completed The Crucible, a three-day, 70-mile hike through the Laurel Highlands that benefited the veterans’ group Checkpoint. The friends, both 39, who met as Montour High School freshmen, raised more than $2,000 for the nonprofit, and the event itself raised more than $71,000. 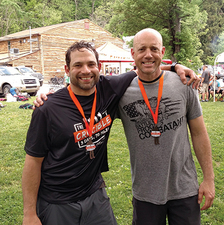 Dwulit and Hubert have participated in other extreme events, such as the Tough Mudder and BattleFrog Obstacle Race Series, to fundraise for national veterans’ groups. The duo registered for The Crucible, which shares its name with the final test that Marine recruits must endure, because they strongly believe in Checkpoint’s mission of providing a central network for local veterans seeking access to the nearly 200 groups offering them resources. Dwulit, a Duquesne Light shop manager from Mount Lebanon, started his military training through the Duquesne University Army ROTC. After graduating and serving as an Army telecommunications officer for four years, he joined the Army Reserve where he trained troops for deployment to the Middle East. His family has strong military ties—his wife, brother, father and grandfathers are veterans. Hubert, from Marshall Township, treats veterans as the facility director of Physical Rehabilitation Services’ Franklin Park location. Both of his grandfathers served in the Korean War. A novice hiker before The Crucible, Hubert had never backpacked prior to training for the challenge. Last January, he started preparing by walking in the snow for three miles while wearing a 50-pound backpack. By spring, he was training four to five times a week by hiking 18 miles in five hours. Scheduling his workouts around spending time with his wife and children, he often hiked early in the morning or late at night, wearing a headlamp. At the time, Dwulit and his family lived in Reading, PA, which lacked the hilly terrain of Hubert’s training grounds. The friends had the opportunity to train together once prior to the three-day hike. “I wouldn’t call myself a true backpacker or hiker. But, as far as carrying a pack, I did it for years with more significant weight,” said Dwulit. Forty-six people started the hike, but fewer than 20 finished. Thunderstorms and humidity created issues for many, said Hubert, crediting the Old Men Walking team—experienced hikers in their 60s—with helping him through the treacherous conditions. Dwulit says he stayed motivated by focusing on traveling from each mile marker to the next. He also remembered his former classmates and cousin who died serving in Afghanistan and Iraq.